A tense, nerve-shredding high seas drama, the Danish film "A Hijacking (Kapringen)" unfolds without the conventional cues you'd expect in a movie. Tobias Lindholm paces this film magnificently with authentic, genuine twists and turns that evolve out of the tenuous moments of real everyday life. A ship in the Indian Ocean has been hijacked by Somali pirates. A negotiating team in Copenhagen engages in talks with the pirates to release the ship's engineer and its cook (Pilou Asbæk), who longs to see his wife and kids again. Well-acted, suspenseful and nuanced, "A Hijacking" kept me on edge wondering what would come next. 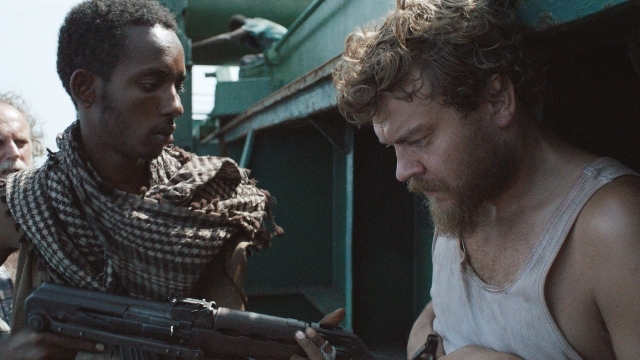 A traumatic, thoughtful and very smart film, "A Hijacking", which opened several months before, exceeds "Captain Phillips" in many respects, and the latter is based on a true story.